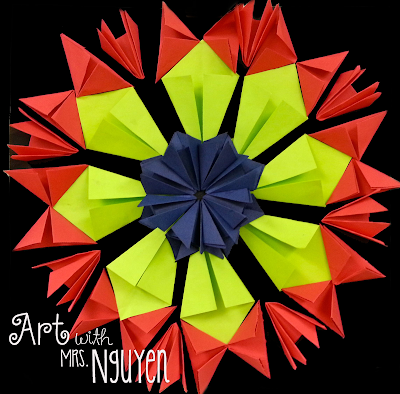 The idea for this lesson came from an image I saw on Pinterest.. but after doing some investigative work - seems to have originated from the blog Art. Paper. Scissors. Glue and before that from the 1991 book written by Sara Beggs, "The No Nonsense Guide to Teaching Art." 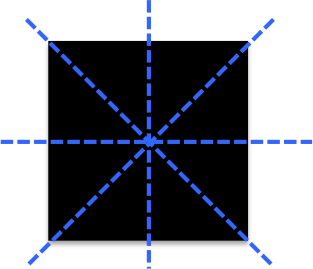 For this lesson we began by taking about what symmetry is and the difference between linear symmetry (1 line of symmetry) and radial symmetry (more than 1 line of symmetry). Then we talked about what a sculpture is (a piece of artwork you can see from all sides - it is 3-dimensional) and what a relief "sculpture" is (a piece of artwork that has depth on the surface but is not meant to be seen from all sides). 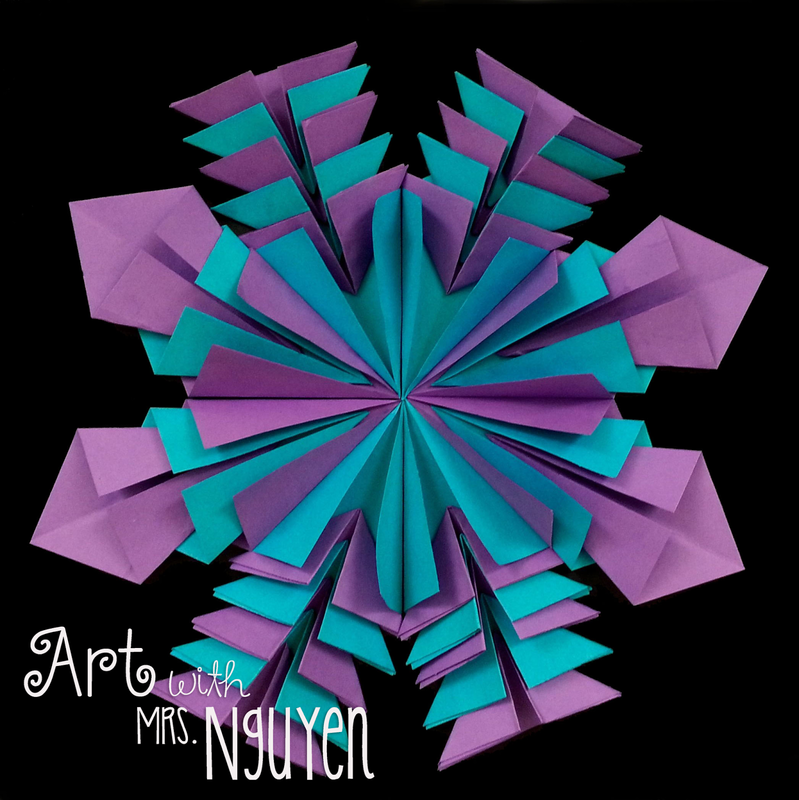 Once students understood the principles behind radial symmetry and sculpture we began creating our very own radial paper relief sculptures! Students started by folding a piece of 12"x12" black construction paper diagonally both ways and vertical and horizontally (to create an 'X' crease and a '+' crease). 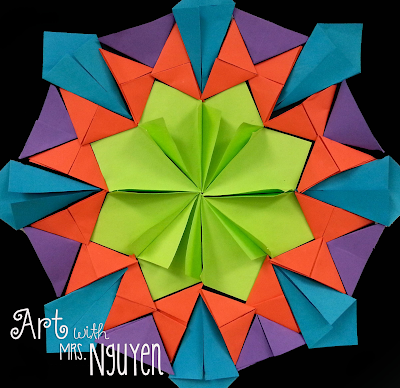 Making these creases makes creating a radial design SO much easier because it gives you guidelines to work with. Once their papers had been folded and their names written, we sat them aside. 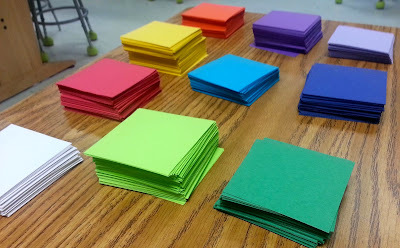 Before having students begin folding their colored paper (each piece was cut to 3" x 3") to fill the inside of their design, I demonstrated 4 folds to them to get them started. *Students were allowed to deviate from these folds if they wanted to. To download the handout below, click on the arrow button in the top right corner (this will open it in a new window). You can download from there. 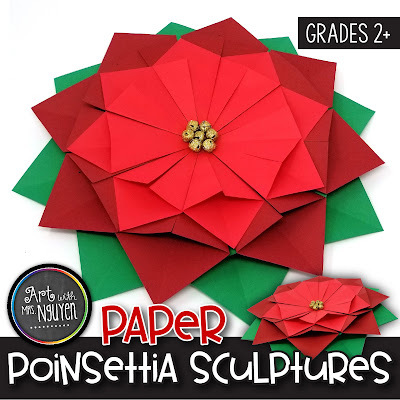 You might also be interested in checking out my Paper Poinsettia Sculpture lesson which uses the same basic concepts. I LOVE how these turned out! They are so interesting and beautiful. Awesome! These are beautiful! I may have to do these with my students next year! These are really cool. How did you store them so they wouldn't flatten? The kids stacked them up on the shelves of my ware cart. There weren't more than 2 or 3 on top of each other. Super Cool!!! I am going to play around and see if I can even do this, Origami is not my strong point :) Thanks for sharing, beautiful pieces. Did you use origami paper? Nope - just construction paper. I cut a bunch of pieces down to 3" x 3"
Did the students glue the shapes to the black paper? I would love to do these with my bunch :) Approximately how many class periods did your students need to produce such awesome results? I have two to three 45 minute classes left with my students and was wondering if that's even enough time to complete a project like this? Thank you for the detailed instructions! Tried this with my class this week with (mostly) great results :) Rather underestimated the number of coloured squares to cut though! Hi there! Love this project! 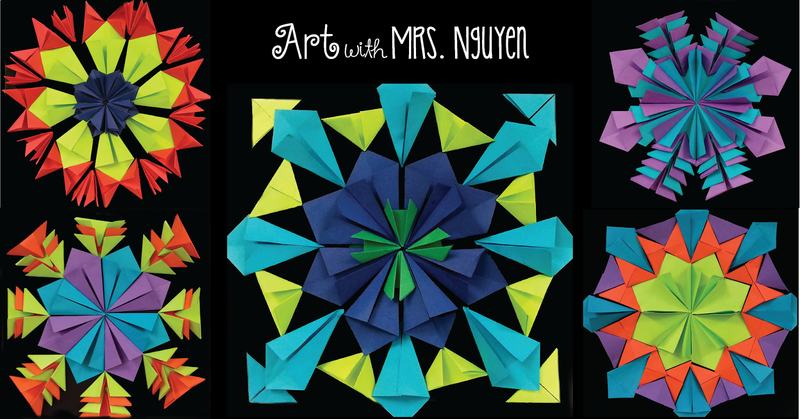 I am planning on doing this with my 5th grade as one of my next projects. I am trying to get a grasp on how many squares of paper that I'll need for this though. I have approximately 250 students that will be doing this and I've been looking at the number of pieces of paper on each one of your examples and the one I did on my own as well, and it's looking to be averaging between 30-40 per student? Would you say that's about right? I wanted to ask, did you have them do any practice folding beforehand? AND, you mention in a response above that your students used construction paper for folding, did they have an okay time folding it? It didn't get too thick to use did it? 25-40 is probably about right... but it really just depends on how complex you get with it. 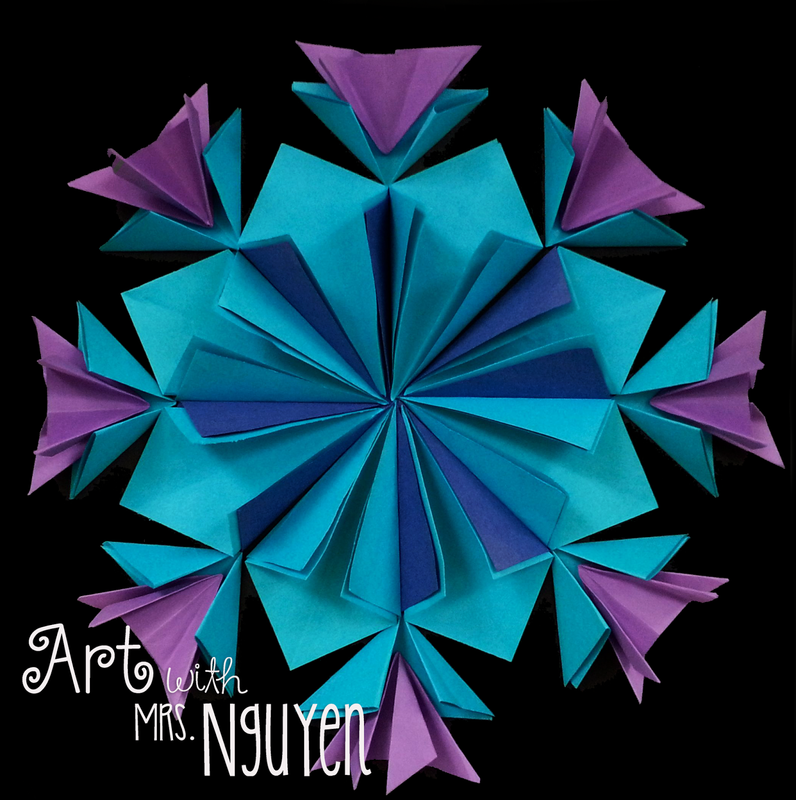 Before beginning I demonstrated each of the folds to my students via my document camera while they followed along at their tables. This definitely helped!! Thanks for the info! I am going to be starting this with my 5th grade in a couple of days. I've been cutting paper like a mad woman! I'm going to give them a choice of 3" squares and 2" squares (because I wanted to get as many squares as possible out of the paper) and I'm going to encourage them to use a mix of sizes for variety. I'm hoping that everything will go well! I did an example they seemed very excited about, so we will see! :) Thanks again for all the info and help! What kind of glue did you use to attach the origami to the black paper? For the most part we just used a regular glue stick.. but some kids may have use liquid school glue (if we ran out). Were you inspired by art paper scissors glue by chance? I'd love the credit! If not... Crazy how our minds work! The website doesn't look like how it used to though.. so I'm not sure if that one is it or not. Very, very interesting. I'm excited to improve myself in this activity with my students. I love origami! 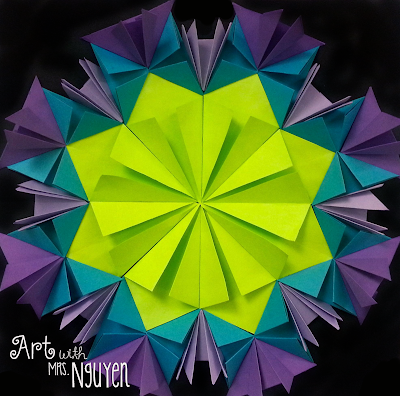 I did this project with my 6th graders using post-it notes and didn't have to use a glue stick for the most part. Students and parents donated the post-it notes. LOVE these! Thank you for posting and sharing. I have been wanting to make these FOREVER but never had the instructions. Very helpful. :) Thank you again! great idea! My pupils have been asking to do something like this for ages. 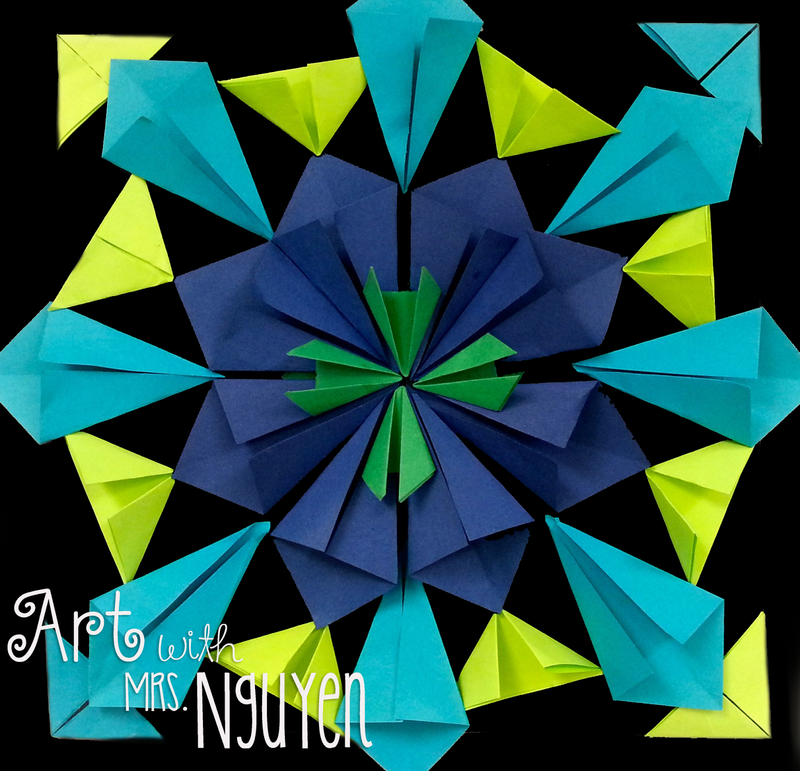 I haven't done this project in years, and I am excited to try it with this variety of folds. I first saw it in an Arts and Activities article and they always come out great! These are beautiful! 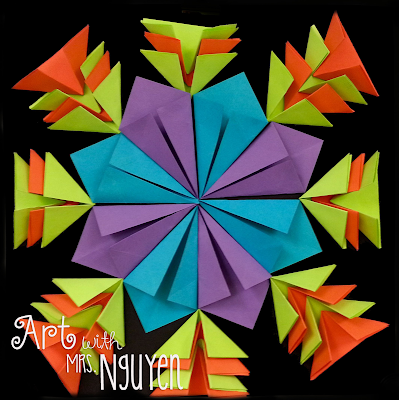 Learning about radial balance is next for my 4th graders... hoping to do this! thank you for the video links and excellent directions!